Champion (Cydonia oblonga 'Champion') produces good crops of Quinces on a regular basis all being well such as the weather, nuclear devastation, tsunami etc. The catalogue states that they are an attractive pear shape however as beauty is in the eye of the beholder, we will leave that judgement up to you. 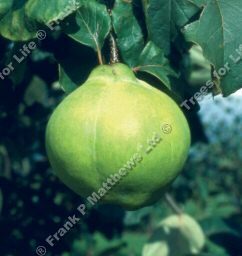 Fertility: Although the Champion Quince variety is listed as self-fertile, some regard it as only partially self fertile. This means you will still get quince fruits from your tree but the yield maybe improved by adding another Quince tree of a different species nearby. Our bare root Champion Quince trees are supplied as Maidens on a rootstock of Quince A. The maiden part of the description means that it has not been pruned or shaped in anyway from Trees Online and that it will reach an ultimate height of 3.5m. For those that cannot visualise 3.5 metres, imagine one 5ft 9" person standing on the head of another 5ft 9" person. If you actually know people that can do this, make friends with them just before harvest time as they will be handy people to know.